We are so glad you decided to check us out! Skydiving is one of the most exciting sports there is. The ability to 'fly' has been a dream of mankind since the beginning of time. 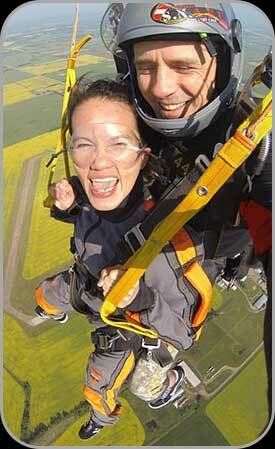 Skydive Big Sky offers Tandem Jumps in order for you to experience your first jump. A Tandem Skydive is where you are physically attached to an instructor by a harness. 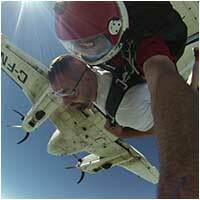 This allows you the thrill of freefall with the comfort of an experienced instructor. You exit the aircraft in tandem from 13,000 feet above the ground. We operate a 10 passenger Piper Navajo and a 14 passenger King Air. 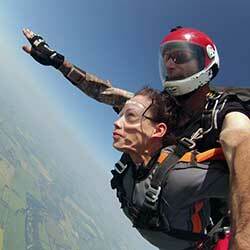 Skydive Big Sky is conveniently located between Edmonton and Calgary, Alberta. Super Tandem From 13,000 ft. (AGL) 16,000 ft. (ASL). 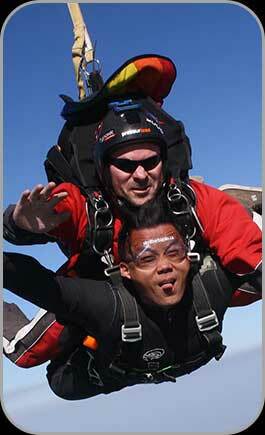 Meet Your Friends from Edmonton and Calgary - Tandem Skydive at Skydive Big Sky! We cannot describe this unique experience, but we will tell you that it will be your most thrilling experience yet! The most exhilarating experience of your life is just one phone call away! Skydive Big Sky in Alberta operates seven days a week, and is available now to assist you with your Tandem Skydiving reservation. Call or Contact Us Today! 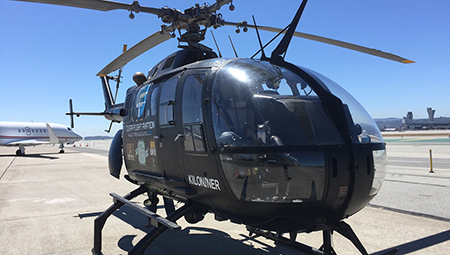 Adventure seekers will now be able to choose to skydive from a helicopter, and we are proud to announce that we will have the Eurocopter Twin Turbine at our Drop Zone at Skydive Big Sky. Skydiving from a helicopter differs from that of a plane in several ways, from the ride to altitude, to exiting the aircraft, and the freefall sensation when you first come out of the door. For experienced skydivers only. Helicopter Skydiving will be offered on select dates throughout the summer. Please Call our Drop Zone For Details. We are located at the Big Bend Airport in Innisfail, Alberta Canada. With the Rocky Mountains on the West horizon, the scenery is great to see and fun to jump over and just 11 KM from downtown Innisfail in central Alberta. Skydive Big Sky is a progressive drop zone. Our desire is to continue to build a drop zone that will accommodate all disciplines of beginner and experienced skydiving. We Currently operate a 10 passenger Piper Navajo and a 14 passenger King Air. Designed for skydivers who are new to wingsuit flying, this course provides all the fundamental instruction required to fly a wingsuit for the very first time. From basic relative work and acrobatic manoeuvres to more advanced skills such as back flying and carving, we will tailor a program to your needs. 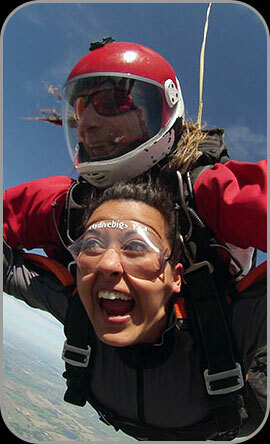 Skydive Big Sky in offers a complete skydive experience for both newcomers and expert jumpers alike. Our focus is on customer service while providing the ultimate in experience to anyone visiting our facility. I mean let’s face it you are jumping out of a perfectly good airplane! We use state of the art equipment and programs to accomplish a professional atmosphere with professional results. All of our skydive instructors are trained and members of the Canadian Sport Parachute Association. Hello to my new favorite friends!! Today's jump was amazing!! Thank-you to Darren and to Andrew!! You Totally ROCK!!! HEY I just did my first tandem jump and it was unbelievable! That was by far the sweetest thing I have ever done! Had my first jump on Sunday! What an amazing day! I'll certainly be back! Thinking of going skydiving? If you are planning to go for your first skydive experience but are feeling a little nervous about it, don't worry it's very common for first time jumpers to feel a little anxious about making the decision to jump. Skydive in Calgary Alberta provides you with the proper training so that you can skydive on your own! 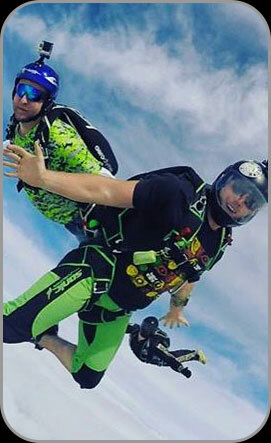 You will have the aid of one of our professional skydive instructors on the airplane right there with you. Jumping out of a plane while attached via a harness to an experienced skydiver is the easiest way to achieve accelerated free fall without hours of pre-training and parachute instruction. How does one go about becoming a skydiver and jumping all by oneself? It begins with the Ground School course. Our Skydive School has been designed with you in mind. Our friendly and knowledgeable staff offers a high level of customer satisfaction, as this keeps the atmosphere fun and exciting. Ground School is your first step to becoming a fully qualified solo jumper. 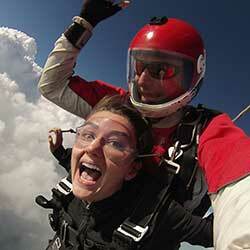 Skydive Big Sky offers a complete skydive experience for newcomers. Our focus is on skydiving safety and providing the ultimate in experience to anyone visiting our facility.